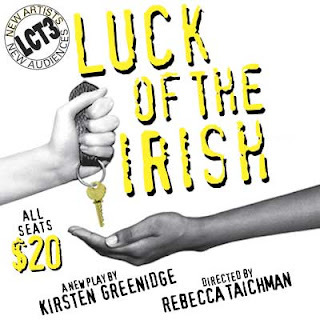 Luck Of The Irish -- currently in previews at LCT3/Lincoln Center Theater and scheduled to run through March 10th -- is almost completely sold out. Fear not! Every day, one hour before show time, there will be a cancellation line at the Claire Tow Theater box office. It might be your only chance to see one of the more anticipated theater performances of the year. And tickets will cost you just $20! The synopsis is as follows: When an upwardly mobile African-American couple wants to buy a home in an all-white neighborhood of 1950's Boston, they pay a struggling Irish family to "ghost-buy" a house on their behalf. Fifty years later, the Irish family wants "their" house back. Moving across two eras, LUCK OF THE IRISH explores racial and social issues and the universal longing for home.